Over Christmas I started riding the Brompton occasionally with both kids on board. At the time, and again now, I noted that this almost certainly voided any manufacturer warranty and was nothing that I could in good conscience officially recommend, etc. etc. I’m not sure how much it matters anyway, as the Brompton is not the cheapest folding bike, plus the IT Chair required to ride with a kid in front, which is awesome, is laughably expensive. We were only comfortable dropping that kind of dosh to celebrate my promotion last year. So this option is not likely to appeal to lots of people. 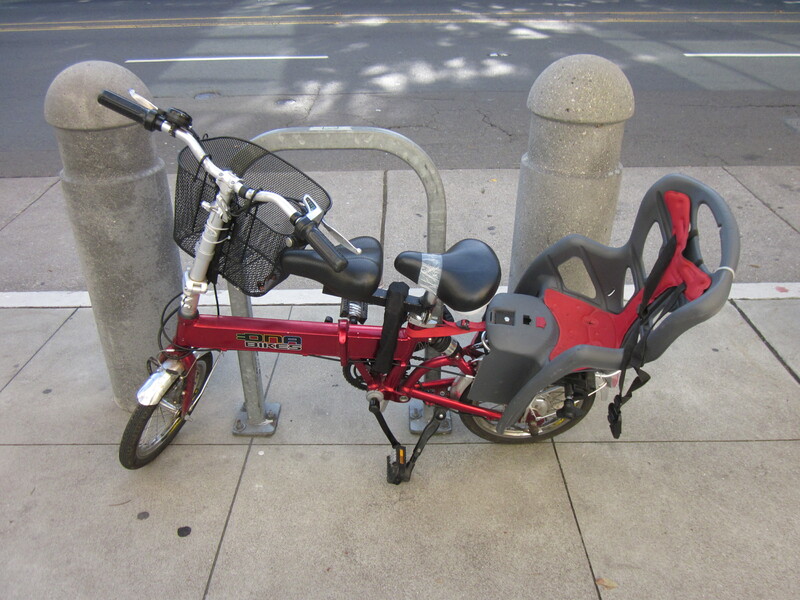 That’s a rear child seat, a double front saddle, and a front cargo basket on a folding bike. Whoa! But it seems I’m not the only person to think about ways to squeeze a couple of kids on a folding bike. At my son’s after-school program, one parent is doing it on the cheap. 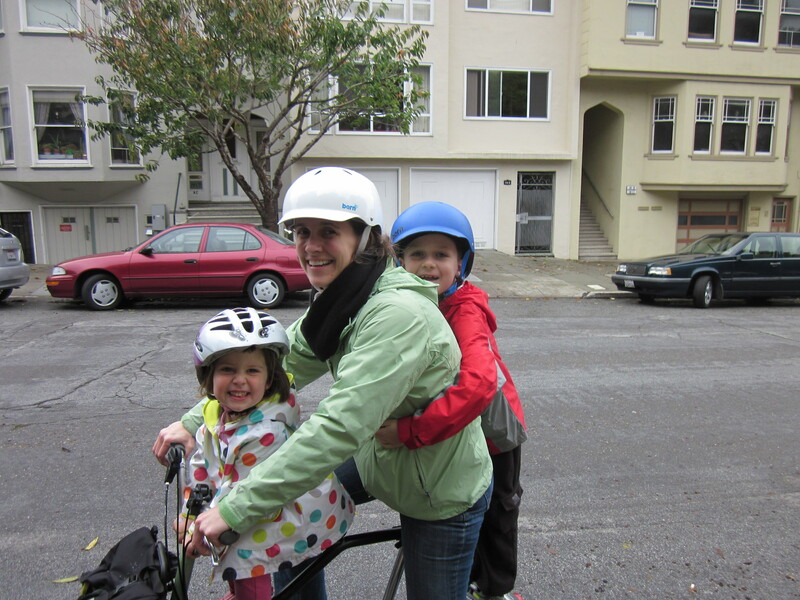 I was awed when I saw this folding bike, which offers a way to haul a rider, two kids, and a fair amount of a cargo in the front basket, with even smaller wheels than the Brompton, and with parts that looked like they could easily be scored secondhand. I wouldn’t call the results pretty, but you know what? This bike could be put on a city bus and take up less room than a folded stroller, and I’m guessing the total rig would cost very little even if assembled brand new. Well played, mystery parent. Well played. Ouch. Imagine how it feels to hit a pothole with those tiny wheels and 75 extra lbs. of child on board. Most child seats aren’t supposed to be installed on less than 26″ wheels. Not sure why but that’s what I’ve heard. People figure out how to do some crazy things and this is a pretty awesome example. Not sure I’d feel okay with it, personally though. The new Juiced ODK has 20″ wheels and is specially made for the Yepp Maxi seat. BabySeat rack is designed for use on 26″ wheel and 700C wheel bicycles only. I imagine it’s because the seat is only tested on those size wheels.